Where is a leader when you need one? He is probably jogging around the White House with his running-mate Joe Biden, trying to keep in shape while figuring out how to keep the Russians in check. Meanwhile in Moscow, Mr Putin must certainly have spilled some of his morning coffee as he read the papers and learnt that Mr Obama might stay at home and not go to Sochi for the G8 get-together next June. European G8 leaders might commiserate and join him in pouting. Leaving aside for a brief moment considerations of fairness, justice and democracy – often waylaid anyhow in times of warmongering and diplomatic posturing – how would the United States government like it, should another superpower decide to meddle in the affairs of a neighbour? Well, just look at Cuba. When that nation decided to rid itself of a narcissistic and utterly corrupt despot, American understanding and magnanimity went out of the window and haven’t been seen since. Meddling by the then Soviet Union brought the world to the brink of nuclear war. In fact and eerily enough, Cuba and the Ukraine are each other’s flipside. The Americans held on to their military base at Guantanamo Bay where they proceeded to imprison and torture people not charged with any crime. The Russians, meanwhile, cling to their naval base in Sevastopol and a few other harbours of the Crimea. Here they keep the Black Sea Fleet – a vast collection of vintage and rather decrepit warships. This fleet may look quite menacing but in contemporary, high-tech reality is quite inoffensive. The brinkmanship of then US president Kennedy tamed the Soviets and thwarted their plans for using Cuba as a forward firing base. President Kennedy understood the uses of power politics, much as Vladimir Putin does today. Mr Putin recently offered a master class in power politics when, with just a few decisive moves, he thwarted attempts by the European Union to lure the Ukraine out of Russian orbit. Still, Mr Putin has been warned: Meddling in the Ukraine will have “a cost” – whatever that means. It is highly unlikely that Mr Putin will keep this cost in mind as he moves to protect and further the interests of his country. In the Crimea, he will create a fait accompli – a situation on the ground that cannot be undone. Where, then, are the other leaders? As mentioned, Mr Obama is running through the corridors of the White House with Mr Biden in tow. Perish the thought: A chicken and head analogy comes to mind. Mr Obama is way too deep into domestic politics to take note of the rest of the world. Besides, Obama is no Kennedy and wouldn’t recognize power if it stared him in the face or bit him somewhere – waging war on third rate countries does not diminish the learning curve. Europe doesn’t fare any better. EU president Van Rompuy is only dangerous insofar that he may cause a foe to perish from laughter. EU Commission president José Manuel Barosso is a skilful operator but, alas, doesn’t command an army, or anything else for that matter. German chancellor Angela Merkel commands a purse, but then again Mr Putin probably has a wrench he may throw into a gasworks. Mr Hollande has but puff and pomp that he mostly uses to awe Africans with, while Mr Cameron is busy dealing with unruly Scots. So, Mr Putin may pretty much do as he pleases. 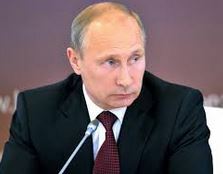 Right now, Mr Putin seems severely displeased with events unfolding in the Ukraine. He also seems to regret his predecessor’s largess. In 1954, Nikita Khrushchev, the notorious shoe-banger and possibly the most endearing leader the Soviet Union ever produced, gave the Crimean Oblast to the Ukraine. Back then, the Ukraine was a constituent part of the Soviet Union and as such a country in name only, and one without the trappings of sovereignty. It would appear Mr Putin wishes to, belatedly, correct this mistake. It’s also a most convenient way to punish the Ukraine for its drift toward Europe – away from its erstwhile mother country. The “cost” Mr Obama rather preposterously warned of, is not one Russia will pay; it will be borne by the Ukraine as the price for asserting its sovereignty. This may be quite unfair to the Ukraine, and to the Tartars of the Crimea, but there is little anyone can do about it. You don’t poke the bear without getting a scratch or two. It is also the price western powers have to pay for their navel gazing. While the US continues to be embroiled in internecine party politics that repeatedly paralyses the nation, and Europe is too busy worrying about a few Romanians and Bulgarians wandering the continent, the wider world actually moves on, shaping the 21st century as it does. The balance of power has shifted and both the US and Europe would be well advised to get with it lest they eventually be relegated to the margins of history.